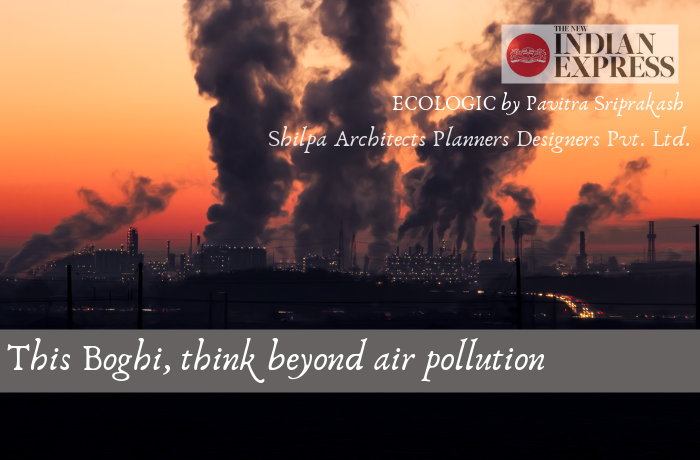 12-Jan-2019 : Pavitra Sriprakash, Director and Chief Designer at Shilpa Architects Planners Designers writes a weekly column on Sustainability for The New Indian Express titled “ECOLOGIC”. This week she writes about air pollution that leads to bio accumulation. As part of the Swachh Bharat campaign, the National Air Quality Index portal produces an Air Quality Index (AQI) value for around 15 cities since April 2015. The monitoring stations measure the concentration of six different pollutants — PM 2.5 (particulate matter of diameter less than 2.5 micrometres), PM 10, sulphur dioxide, nitrogen dioxide, carbon monoxide and ozone. Of these, PM 2.5 is considered the ‘prominent pollutant’. The data shows that the PM 2.5 levels in predominantly residential parts of the city are in check from April through October (summer months). The levels start spiking to reach between 101-200 or moderate (indicating that it can cause breathing discomfort to the people with lung, asthma or heart disease) from November onwards (due to Deepavali) and then don’t quite come down back to the averages of August (around 30 PPM), but are instead linger at above 100 PPM from December to January. The rise in air pollution has to do with the change in weather in the city. With lower temperatures and high moisture, there is dew formation and this tends to capture and retain the particulate matter. These levels will definitely spike further during the upcoming Bhogi festival. The main concept of the festival is change or transformation and this is brought about by people discarding old and derelict items from their homes — consisting clothing or other household items. Community bon fires are started and people are brought together to celebrate this ‘embrace of change’ in their lives. As we all know, today’s household items tend to be highly processed or even can be e-waste, and open burning of these will release toxins into the atmosphere causing many health issues for people. Apart from obviously affecting the air quality, there are other pollutants that are released from having such neighborhood or backyard burning sessions. The waste travels through the air either short or long distances and are then deposited onto land or into bodies of water. A few of these pollutants such as mercury, polychlorina-ted biphenyls (PCBs), dioxins and furans persist for long periods of time in the environment. They have a tendency to bio-accumulate — which means they build up in the bodies of animals that are found at the top of the food web. Contaminated water and food sources are the main culprits for bioaccumulation rather than breathing the contaminated air directly. The range of effects associated with these pollutants include cancer, deformed offspring, reproductive failure, immune diseases and subtle neuro- behavioural effects. Human beings are also exposed to such pollutants especially through consumption of contaminated fish, meat and dairy products. So, this Bhogi, think beyond the air we breathe and take for granted. Strive to educate all the people around us to celebrate responsibly too. While we can collect the data and complain about the rise in pollutant levels yet again, we can console ourselves by saying — come summer, the air quality will improve again. But, stop and think beyond that — once it is embedded in the eco-system, these pollutants are extremely hard to get rid of. Be Swacch, don’t burn your trash — let us help transform our environment this Bhogi by saving it from further pollutants.